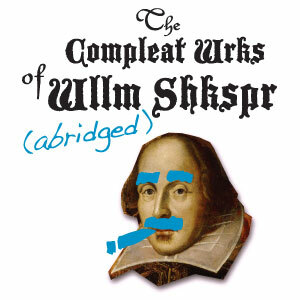 An irreverent, fast-paced romp through all thirty-seven of the Bard’s plays in less than ninety minutes, The Complete Works of William Shakespeare (abridged) was London’s longest-running comedy and is now educating and entertaining young and young-at-heart alike. Join the cast as they weave their way through all of Shakespeare’s comedies, histories and tragedies in one wild, hilarious ride. A JT Premiere! Recommended for ages 10 and older. Shown in Repertory with The Stinky Cheese Man and Go, Dog. Go! Written by Adam Long, Daniel Singer and Jess Winfield. Based on the works of William Shakespeare. Presented through special arrangement with Broadway Play Publishing Inc., 224 East 62nd Street, New York, NY 10065. Phone: 212-772-8334. Fax: 212-772-8358. www.BroadwayPlayPubl.com. Production sponsored in part by the City of San Diego Commission for Arts and Culture, the City of San Diego Park and Recreation Department, and the County of San Diego.